Ever since the woman he once adored told Jay Kendrich he was a chivalrous hero, he has tried to live up to the praise. But when things don't work out with Jane, moving on and dating other girls proves to be a chore. That is until he meets fellow Harvard student Sarah Morgan. Although Sarah is a freshman studying music and Jay is in his third year of law school, he discovers they have much in common. He has also discovered that getting to know the shy pianist is painful. The last thing Jay expected from his friendly advances was to be assaulted by a brawny stranger. It is abundantly clear that someone wants him to stay away from Sarah. If only he could. As long as she can remember, Sarah has lived under a watchful eye. While her father insists it's for her own protections, Sarah feels imprisoned. As she begins to believe that those she has trusted most don't have her best interest at heart, she is driven further from her respected father and closer to Jay. But their love will come at a high price as the pair edges closer toward to a truth that is darker than either of them could have imagined. The car started forward, and from the corner of his eye Grant studied Sarah’s reflection in the glass. Fresh tears rolled down her cheeks, though she didn’t make so much as a whimper. Her hair was in need of a good brushing, and it hung long and wispy half-way down her back. He thought perhaps tomorrow he would take her to get it cut short; it would certainly be easier to care for. But then he thought of Rachel and reconsidered. Sarah’s golden hair, when washed and brushed, would no doubt be as beautiful as her mother’s had been. It was comforting to know there was something in her to remind him of Rachel. Sarah shifted on the seat, tugged her dress down again, then removed the handkerchief from her chin and placed it carefully across a four-inch tear down the front of her dress. She wiped a dirty hand across her cheeks, drying the last of her tears, and turned to her father with a positively mutinous expression. “Kitty—isn’t real.” Her eyes were hopeful. “Too bad.” Grant stopped at a light and caught the driver in the car beside them looking at him. Unnerved once more, Grant eased the car into the intersection when the light turned green. The car in the other lane moved ahead and turned three streets later. Grant headed toward the Boston University Bridge, thick now with rush hour traffic leaving the city. “Kitty is at Mommy’s house,” Sarah said. Grant heard the desperation in her voice. “We can’t ever go back there,” he said with a note of finality. “I don’t want to live with you,” she said. “Yeah? Well I don’t particularly want to live with you either,” Grant lied. He’d wanted nothing more for the past two years than to have his wife and daughter back in his life. Every time he and Rachel had tried to patch things up their differences became more apparent, but he’d never stopped loving her. “Then take me home.” Sarah’s voice was quieter. “No.” Sarah shook her head and turned away from him. Her shoulders lifted up and down in a dramatic sigh. Grant thought he saw her lip quiver again, but she remained silent. His daughter had his wife’s coloring and features, but she wasn’t schooled in how to use them to her advantage. And she never will be, he vowed. Sarah need never know how beautiful she was—and would certainly be when she grew older. She would never learn what could happen to a man when she tossed that halo of hair over her shoulder and looked up at him with those baby blues filled with tears. He would keep her away from men. He’d raise her to be strong and sensible. What am I thinking? The safest, most practical thing would be to ship her off to a secure boarding school—as far away from him as possible. As he drove, he mulled this over—the pros heavily outweighing the cons—and made up his mind to do just that. For the remainder of the drive he ignored her, thinking instead about his recent job change to the small police department in Summerfield. It was his chance to start over. To keep things honest, simple. Pulling into the driveway, he cut the engine and looked over at Sarah. Her eyes were closed, and she was curled up in a ball on the seat. Grant got out of the car, made a point of slamming his door, and walked to the box at the curb to retrieve his mail. He shuffled through the envelopes as he came back up the drive, then rapped his knuckles against the car window. Sarah didn’t stir. So much for not being able to sleep without Kitty. He stuck the mail in his coat pocket, opened the door, and carefully lifted Sarah in his arms. She stirred for a second, turning her face into his chest. He froze, a sudden deja vu overtaking his senses. She weighed next to nothing and still had that same little girl smell he remembered. It seemed just yesterday he’d cradled her like this when she was a baby. Walking toward the house, his lips were set in a stern line. He opened the front door, kicked it shut behind him, and carried her to the couch. He placed a pillow beneath her head and covered her with a blanket, tucking her slender arms inside. Stepping back, he watched as her tiny chest rose in a shuddering breath. Her lips puckered for a brief moment, and Grant wondered if she was having a bad dream. Something much more than pity stirred deep inside, causing his throat to constrict. Leaning forward, he placed a gentle kiss on her forehead. “It’ll be all right, Sarah,” he whispered, praying it would because he suddenly knew he couldn’t send her away—just as he knew he already loved his little girl even more than he had once loved her mother. Michele graduated from BYU with a degree in elementary education--something that has come in handy with her five children, all of whom require food, transportation, or Band-Aids the moment she sits down at her computer to write. Michele's first published novel, Counting Stars, won the 2007 Whitney Award for best romance. 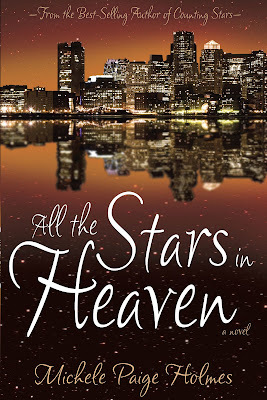 All the Stars in Heaven continues the story of one of the characters from the first novel. 1 entry for sharing why you love romance. Tomorrow will be our last January giveaway - Love Your Body by Brooke Parker. Many of the contests are still open, so please feel free to keep entering. Cami, you have a great blog! Just found out about it -- Looking forward to following. Without romance life wouldn't be worth living. I'm a follower of your blog. Romance warms the heart and lifts the soul! The contest has been on my blog, twitter and facebook all month and I'm a follower. I've read Michelle Holmes first book and I'm dying to read her second. This has been a great giveaway Cami! Hi, Michele & Cami! Thank you for a great giveaway! I love romance because it is life affirming : ) We all need a lasting romantic connection in our lives. Romance makes a marriage & relationships better. If you don't have romance, then its nice to at least read about a romance,and wish you are the character in the book. Oh, oh, pick me. I'm a follower. Tweeted it (also on Facebook). I live in a romance novel with my wonderfully romantic husband and we have the happily ever after. I like to read, and write, romance because I think love makes the world go 'round. I love romance because there is always hope and surprise and comfort. I loved Michele's first book! I definitely want to win. I love romance, it's so fun to curl up with a good romance story. I love romance because it makes me feel special and loved. I love romance because I can meet new friends, visit far away places that are new to me and lose myself in another world for some time. How fun to sit down to all these great entries. My entire family has (or is recovering from) strep throat. We really need some romance at our house. Oh, I love romance books because she usually gets her man. I love Romance because there is always a happy ending even if at times it does not seem that way. It adds more to the story with romance involved. I forgot to mention I have your contest posted on my facebook. I just became a follower and would love to be entered in your draw. Thanks. I love romance because it gives me butterflies in my tummy!! I love to read romances because of the warm and hopeful feeling it gives me.